Roberta Warshaw Art and Design: Wonderful Jewelry! 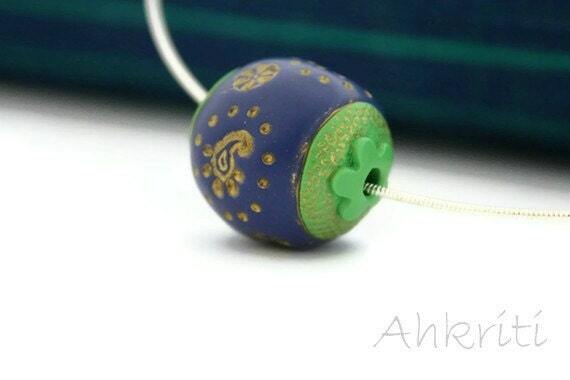 One of my wonderful, repeat customers, Reshma of AhKriti has blogged today about my beads here. Reshma makes really lovely jewelry and I am proud that she finds my polymer beads worthy of her work. It is very exciting for me to see how jewelry artists use my work. I often don't see that because many times people who buy my beads are collectors and just hold on to them. Which is fine too! It was Reshma who wanted beads with a decidedly Indian twist and she requested beads with paisley designs. Back when I was in college and high school, paisley was all the rage! I still remember all those wonderful Indian bedspreads we had all over our dorm rooms with the colorful paisley designs. But that was quite a while ago and I hadn't really thought about paisley since then. But Indian design still uses lots of paisley. I had a small paisley design stamp that came with one of my stamp sets but it was really too tiny. I wanted something a bit larger. So I found a set of rubber stamps that had a mix of designs and cut out just the paisley part I wanted. I cemented it to the end of a dowel and it worked perfectly. I added some floral stamps to the design and they really look nice as you can see from the photo. Thank you for this mention Roberta! You have such wonderful designs in your store and your new verdigris creations are simply outstanding! I really look forward to working with you as well! What a beautiful bead! I love the paisley and the vibrant colors. Wow, I like the color schemes you regularly use, but it's so cool to see your work in some shades outside of your comfort zone! An Unusual Day to Say the Least!